The Council Administration Building is an accessible public building located in Front Street, Mossman. The Council Administration Building provides a base where ratepayers, residents and visitors are able to access a range of Council services and information and is the general location of Council Ordinary and Special meetings which the general public are welcome to attend. The Council Administration Building does not have public meeting rooms available for hire. Council provides a number of accessible, multi-purpose community centres to help meet the diverse needs of our residents and visitors. 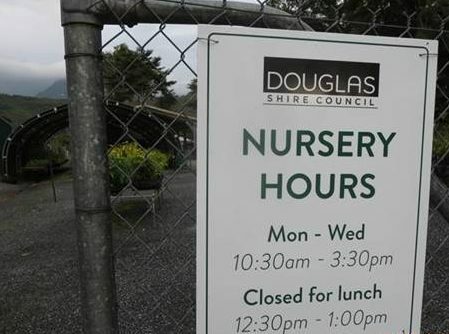 Council provides six natives plants per year per property for Douglas Shire residents. The Port Douglas Community Hub is located at the Port Douglas Community Hall in Mowbray St and combines the new SpacePort co-working space, the library kiosk and Customer Service. • SpacePort is a casual co-working space that existing small businesses (such as business people on vacation) as well as new and emerging local businesses and entrepreneurs can utilise as a convenient alternative to their own homes. It is an inexpensive facility for businesses which find the cost of commercial office rental space too prohibitive and not yet economically viable as part of their business plan. • Business workshops and other related professional development training may be offered through the SpacePort facility, especially start-up and innovation activities which allow entrepreneurs who have a similar aim or goal of commercialising their ideas into reality. • SpacePort is ideal for tertiary and secondary students wanting a quiet space to focus and study without the distractions which the home environment can’t offer. Students working on team projects or assignments can use this space create and grow their ideas. • Stuck for a meeting space – SpacePort has a large room with a conference table for 4 people, with the ability to add more chairs, a couch and white board. • 3 casual or semi-permanent desk spaces available for individuals needing somewhere quiet to focus. • Open Monday to Friday 9.30am to 4pm. Community halls and centres are designated community buildings which can be used/hired by residents. These venues provide focal points for community interaction and social support, for safe, enjoyable activities and for the delivery of services that benefit the community. For the full list of Council venues available for hire visit the Venue Hire Information page. For all bookings and general enquiries please contact Council’s Frontline Services on (07) 4099 9444, and Download relevant forms found in Facilities, Sport & Recreation folder.